Identify and record the surviving features of the historic designed landscape associated with the late Georgian Plean House ruin, built in 1820. Complete a survey of the Country Park to identify the contemporary components of the Country Park and undertake an assessment of them. Undertake a community consultation process and interpret the findings. Prepare a Masterplan for the Country Park which makes recommendations for the retention and management of components of the designed landscape including built heritage and natural heritage features. Prepare a 10 year Management and Maintenance Plan to accompany the Masterplan proposals. The full plan can be viewed here (large pdf file). Note that the Plan is © Stirling Council and is provided for personal use only. It cannot be reproduced without permission. Plean Country Park is currently owned and managed by Stirling Council who bought the former estate from the National Coal Board and in 1989 turned it into a Country Park. The Country Park is firstly a natural experience, one of woodlands, meadows and watercourses. However, man’s influence is everywhere. There is little if anything untouched and therefore natural about Plean Country Park. It is a highly manufactured landscape, which has been influenced by the activities of man. Initially there was the mineral extraction of sandstone at Blackcraigs quarry, and the laying out of a designed landscape associated with the late Georgian Plean House in 1820. It is thought that sandstone quarried at Blackcriags was used in the construction of the estate buildings and masonry Ha-Ha’s within the designed landscape. The estate landscape includes a mansion house, stables, walled garden and workers houses, which remained relatively unchanged for a Century and a half between 1820 and 1970 when the house remained in private ownership. The extraction of coal from rich mineral seams deep beneath the estate transformed the context and landscape setting of the estate. Pits were built on the edges of the estate, with associated mineral railways and coal waste was deposited to form bings, which became dominant features of the surrounding landscape. The Country Park measures 90 hectares or 205 acres in size and includes all of the former policies of Plean House. These policies are now 200 year old mature estate woodland and naturalised birch scrub woodland to the colliery bings. The Country Park benefits from the former estate drives which link the surviving componentsof the designed landscape, together with the Plean Burn and Pleanbank burn watercourses. The Country Park is visited by approximately 30,000 people annually. The returns from the Community Consultation showed that visitors come from all over Central Scotland to use the park. Many visitors come to Plean Country Park to experience it’s tranquil and natural setting. The Country Park is located on the southern boundary of Stirlingshire, and due to the roads infrastructure, it is readily accessible from the neighbouring local authorities of Falkirk and North Lanarkshire and returning visitors travel from the nearby settlements of Stirling, Bannockburn, Denny and Dunipace, Larbert, Falkirk and Stenhousemuir. Whilst Plean Country Park is not included on the register of Country Parks registered in Scotland established by Local Authorities under Section 48 of the Countryside (Scotland) Act 1967 and included in the Register established by the Countryside Commission for Scotland. Plean Country Park has the necessary criteria and includes all the facilities for its inclusion on the register. Whether it is dog walking, horse riding, visiting with children, cycling, pond dipping, enjoying a picnic or stroll amongst mature trees, Plean Country Park is a great place to visit. There are a series of way marked walks from the car park including the Heritage Walk, Estate Stroll, Nature Trail, Woodland Trek and Horse Trail. The Eastern Areas Ranger Service is based within the Walled Garden at Plean Country Park and Stirling Council has an events programme which includes events within the Country Park. There is an established Friends of Plean Country Park Group. The group is a voluntary charitable organisation with the aim to conserve, enhance and promote the park for the benefit of people and the natural environment. 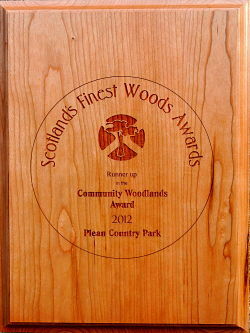 The Friends of Plean Country Park are pro active in raising the profile of the Country Park within the Community and in reporting and liaising with Stirling Council.